Alcohol is a drug. A drug is simply "Any substance which when absorbed into a living organism may modify one or more of its functions." Alcohol is the most commonly used and widely abused drug in the world. Alcohol affects your body… As it is absorbed directly into the bloodstream, every organ is affected which may increase the risk of life-threatening diseases, including cancer. The liver can only effectively process one (1) standard drink per hour. Proof is the amount of alcohol in hard liquor or distilled spirits. The percentage of pure alcohol in the hard liquor is usually one-half the proof. For example, a 100-proof liquor is about 50% pure alcohol. Thus, the higher the proof, the more pure alcohol the hard liquor contains. Binge drinking is a pattern of excessive alcohol use that increases a person's blood alcohol content very rapidly. For men, binge drinking is defined as 5 or more drinks in a row and for women, 4 or more drinks in a row. The definition of blood alcohol content is the concentration of alcohol in one's bloodstream, expressed as a percentage. Blood alcohol content, or BAC, is used to determine whether a person is legally intoxicated, especially in operating or attempting to operate a motor vehicle. Subtract .01% for each 60 minutes of drinking. 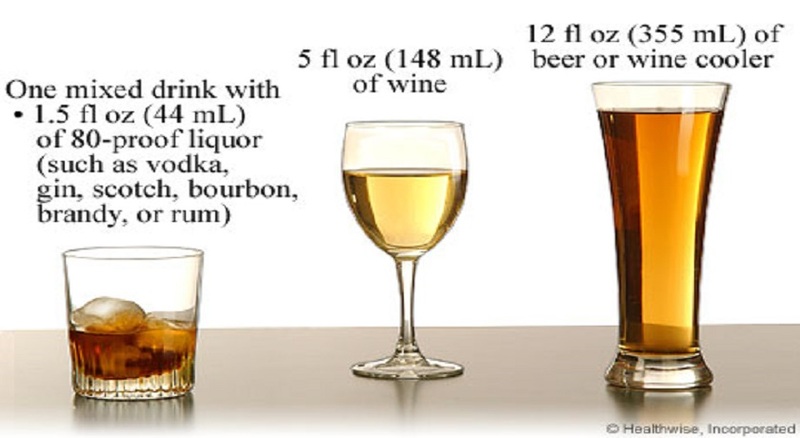 One drink is 1.5 oz. of 80 proof liquor, 5 oz. of wine, or 12 oz. of beer. Blackouts, sometimes referred to as alcohol-related memory loss or "alcoholic amnesia", occur when people have no memory of what happened while intoxicated. These periods may last from a few hours to several days. During a blackout, someone may appear to be fine; however, once sober, he/she has no recollection of events. Let your friend "sleep it off"
The only way to become sober is time. Eating, drinking coffee or energizer drinks, sleeping, taking a cold shower – none of these things will help you become sober. For every drink a person consumes, he or she must let an hour pass without taking in any more alcohol before being sober. It is true that drinking water will help with dehydration and dehydration is a major cause of hangovers but drinking water will not sober you up.